On January 4, 2008, 5 year old Ivory went to the hospital in Columbus, Ohio, because she was throwing up and had been suffering from headaches. The doctors did a CT scan and discovered a very large mass on the back of her brain. Doctors told Julie that this tumor could kill Ivory. On January 7, 2008, Ivory had surgery to remove the tumor. Ivory was feeling as one would expect after major surgery but she was doing OK.. However, after 48 hours, she began to feel pain in her stomach; it was difficult for her to move. Pain medications did not help and sadly, she became very angry at the level of pain she felt. Her oxygen alarm kept going off several times each hour. On January 11, 2008, Ivory was rushed to the ICU but on the way, she coded. When doctors did an xray, they found a hole in her stomach due to acid in her stomach and she was rushed back into surgery.1/11/08 ivory is ruched to the icu she codes on on the way. an x-ray shows a hole in her tummy. she is rushed back to surgery. Then on January 17, 2008, Ivory was rushed back into surgery a third time. The hole that was closed was coming back within 24 hours. 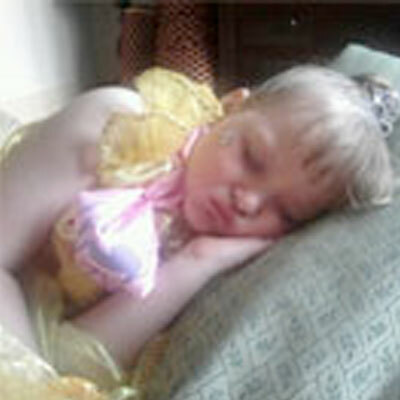 Doctors then told the family that Ivory was showing signs of having ARDS and in fact, on January 18th, once Ivory was out of surgery, doctors said she had ARDS, was septic, in a coma and would not survive the next 24 hours short of a miracle. On January 19, 2008, Ivory was put on an oscillator, which takes three tries for her to accept. At this point, Ivory blew up from fluid overload, weighing 54 pounds. Her weight upon admission had been 34 pounds. For one week, she required constant dialysis. She had three chest tubes, three peg tubes in her stomach, a wound vac that they had to change numerous times to check the hole and clean her inside. After weeks in a coma, so critically ill and close to death, Ivory finally awoke. Doctors inserted a trach tube. And they needed to begin radiation as soon as possible to stop the spread of any tumor that might have been left behind. Nine days after getting the trach, the MRI showed no signs of a tumor. And after five months of having a trach, it is finally removed for the last time. Ivory stayed in the hospital a total of more than three months. She still had to go to the hospital for radiation after. Since being ill, Ivory still has a cough and problems with her lungs. She needs to take six different medications to help her lungs to get better. After ten months, Julie was told that they are only 55-60 % of the way there. But on December 10, 2008, Ivory turned 6! This was a wonderful and remarkable birthday for everyone; it was one that Ivory and her family were told she would never see.